Just when you thought you were prepared for the 61st annual Grammy Awards, the evening’s festivities kicked off with a bang. 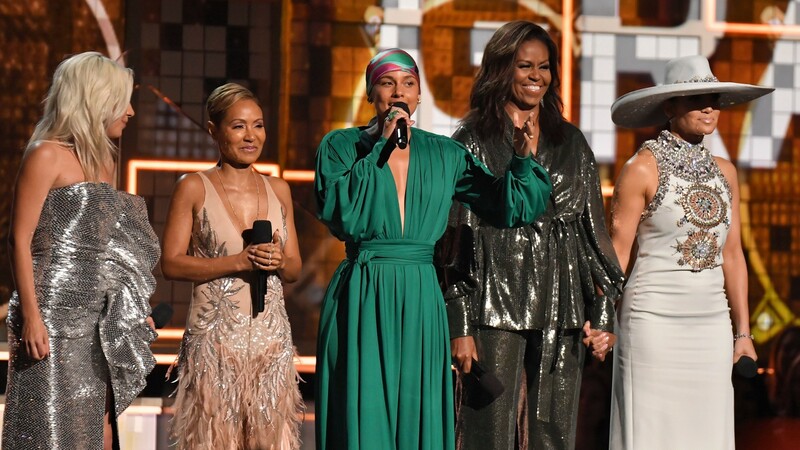 Former first lady of the United States Michelle Obama made a surprise Grammys appearance, joining host Alicia Keys on stage with Grammy nominee Lady Gaga, Jada Pinkett Smith and Jennifer Lopez. Obama’s appearance got the entire Grammys audience on their feet with excitement, and when she got the mic, she shared why music matters to her. Keys ditched the traditional award show opening monologue, instead standing to the side and letting four equally powerful women — Obama, Lady Gaga, Pinkett Smith and Lopez — take the stage with her. Each woman got a turn at the mic to say why music matters to her and why it has such a special place in her life. When it was Obama’s turn, the crowd gave her a warm standing ovation that continued until she had to affectionately hush them up, joking, “All right, we have a show to do!” before saying her piece. Obama’s moment was our favorite of the opening remarks. We also have love for the comments made by Gaga, Pinkett Smith and Lopez, but between Obama’s surprise appearance and Keys ending the opening moment with a delicious Beyoncé reference, asking the crowd, “Who run the world?” we’re just delighted by this Grammys opener. Also, we’re gonna make the gentle request that more award shows bring in Obama for surprise appearances, please and thank you, because she is a national treasure.